Roman, Rowan, and Ronan are all in the US Top 1000. How about this similar name? With a happy birthday to my brother, our Baby Name of the Day is Roan. Roan: One Syllable or Two? Does Roan sound like Rowan – two syllables? Or does it rhyme with cone and drone and Joan – one syllable only? The dominant pronunciation seems to be the latter – sounds like Joan. It’s definitely the way the color is pronounced. But I’ve heard it said more like Rowan, and I suspect that many people would default to that sound. 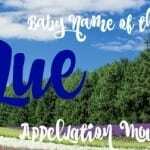 As with so many things in baby naming, it depends! There’s more than one possible source for the name, but they all lead back to animals. This first one is a little tenuous, but I’m including it anyway. The Germanic element hraban means raven. 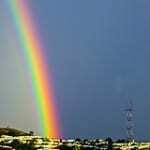 Names like Guntram and Rambert include the element. 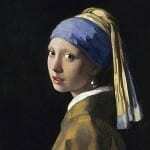 In Frisian, names containing hraban could become Ronne for short – which rhymes with Joan. Frisian was spoken in northern Germany, as well as parts of Denmark and the Netherlands bordering the North Sea. Today most speakers live in the Netherlands. 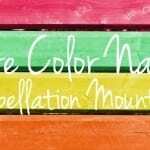 It’s also found as a surname, with other possible meanings attached. Roan is mostly strongly associated with horses, though dogs and cattle are even antelopes can be described as roan, too. While you’ll hear roan referred to as a color, it’s more of a pattern – white and another color, either blue, or grey, or strawberry, or red, or bay. The two hair colors are mixed. Roan isn’t rare, as horses go, so if you’ve spent any time amongst the equine, you’ve probably spotted one. In 1994, the novel The Secret of Roan Inish was made into a movie. It’s based on Irish folktales about selkies – mermaid-esque creatures, seals who shed their skins to become human. Roan Inish isn’t a character – it’s the island near where young Fiona is sent to live with her grandparents. The island is said to be the selkies’ home. It’s believed they kidnapped Fiona’s baby brother to live among them. It’s a romantic tale, and a movie that, while not quite a classic, remains watched. Yet again, Roan rhymes with Joan. 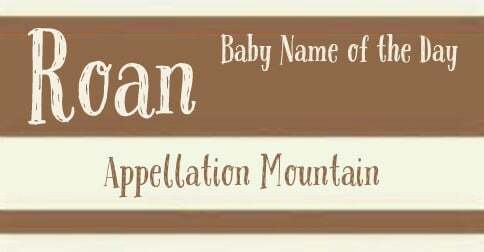 None of this makes Roan a baby name. And yet, Roan has been given to a small number of boys over the years. Peak use was from 2005 to 2008. Credit might go to Rowan and other Ro- names on the rise at the time. Or it might go to Sharon Stone. Stone and ex-husband Phil Bronstein welcomed son Roan Joseph in 2000. She later adopted two more sons, Laird Vonne and Quinn Kelly. Stone pronounces her eldest son’s name like Rowan. While Stone’s biggest blockbusters were from the 1990s – Basic Instinct was released in 1992! – she’s never left the spotlight for long, and her sons have often accompanied her to public events. So perhaps, it’s the actress and her family who get credit for making this name an alternate spelling of the very popular Rowan. All of this could lead to a certain amount of confusion. 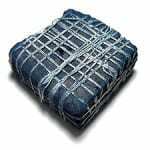 The rhymes-with-Joan option puts this name in the company of Kai and Chase – short names for boys with strong sounds and plenty of energy. Sounds-like-Rowan is a little different. It’s equally stylish, but a little more gentle – more of a nature name, maybe. 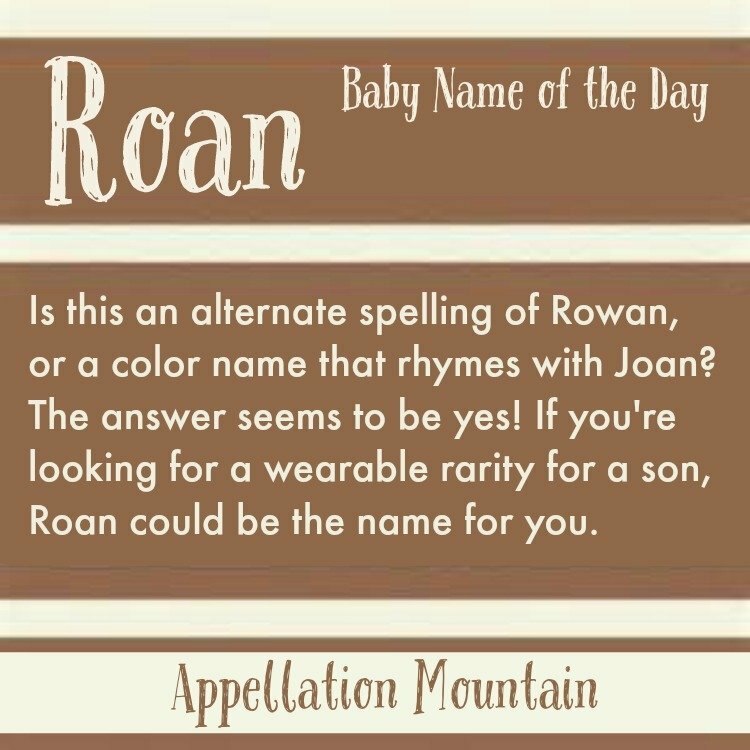 If you don’t mind potentially correcting the pronunciation of your child’s name, Roan is an interesting possibility for a son born today. 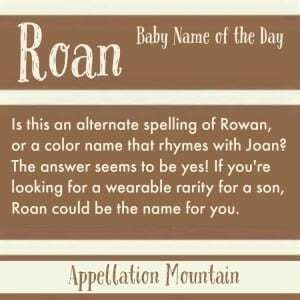 What do you think of Roan, and how would you say this name? We like to say it rhymes with ‘throne’ or ‘stone’. This is our son’s name, we thought the spelling of Rohn was more manly. My husband was raised in Scotland so we liked the Celtic tone. I know a little Roan! He was named after Roan Mountain, which holds a lot of significance to his parents. I’d say it to rhyme with Joan in large part because of The Secret of Roan Inish, a movie my daughter loved. I know a little girl named Roan (pronounced Rowan). It is a family name in her family.